15th annual MAAC Charity Golf Tournament winners, from left: Mike Wong, Randy Louie, Charles Chaloeicheep, Sakul Chaloeicheep. 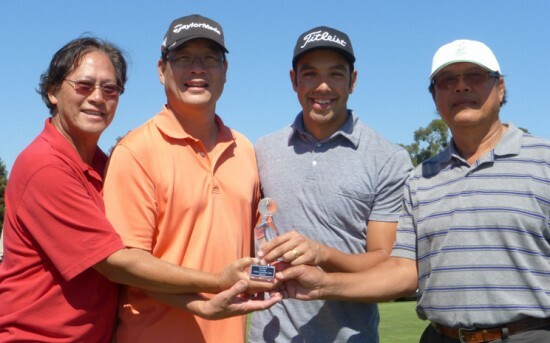 MORAGA — The 15th annual Moraga Asian American Club Charity Golf Tournament was held Sept. 14 at Chuck Corica Golf Complex with funds going to typhoon relief in the Philippines and Girls Incorporated of Alameda County to help build strong, smart and bold girls. The team of Mike Wong, Randy Louie, Sakul Chaloeicheep and Charles Chaloeicheep, scored a net 62 and captured top honors in Flight 1. Moraga Asian American Club (MAAC) began in 1998 and incorporated in 2000 in recognition that Lamorinda (Lafayette-Moraga-Orinda) is a culturally diverse community with Asian Americans comprising significant numbers. MAAC was formed to provide a forum for common issues as well as to promote civic involvement and diversity efforts that value respect for differences to build an inclusive community for all. MAAC is a resource for its members as well as the Lamorinda community at large. Early activities included diversity stipends to school teachers, API heritage celebrations, library displays, and sensitivity training. Originally launched in 2001, the MAAC Charity Golf Tournament was conceived as an opportunity for MAAC members to get to know one another, but it quickly evolved into a fundraiser for diversity mini-grants within the Moraga School District. Subsequent donations have benefited National Alliance of Vietnamese American Service Agencies for Katrina Relief, Moraga Educational Foundation Diversity programming, Moraga Habitat for Humanity, Asian materials for the Moraga Library, The Hacienda Foundation of Moraga, and Northern Japan earthquake relief efforts.